Raise your hand if you love football, Super Bowl parties or the commercials! 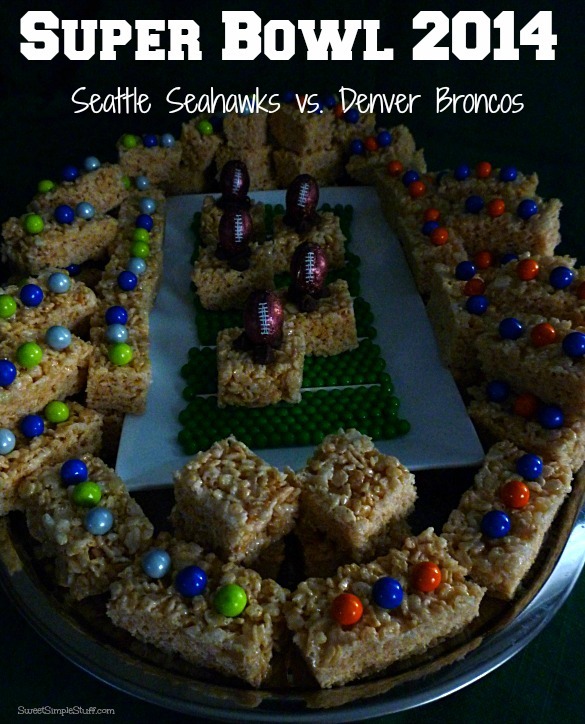 Are you cheering for the Broncos, Seahawks or the snacks? 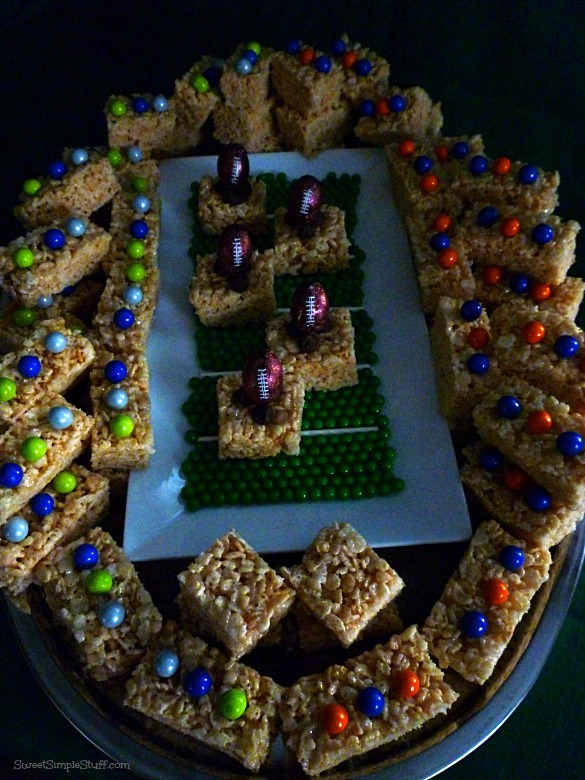 Today, I made a football stadium with Rice Krispie Treats … perfect for a Super Bowl party! It is sure to satisfy everybody … doesn’t everybody like basic Rice Krispie Treats? They are always a favorite around here … no matter which team you are supporting! I learned a few things while making this project and I will share them with you. Spray or use butter to grease a 10″ x 15″ x 1″ pan (jelly roll) and grease a spatula too. Melt butter over low heat, in a large (6 quart) pan, add marshmallows and stir until melted. Remove from heat add cereal immediately and stir until cereal is completely combined. Scoop into prepared pan and use spatula to pack the cereal mixture into pan. Let cool before cutting. Son #3 came up with this idea! Cut a few small cereal squares (1-3/4″) and turn upside down (the bottom is stickier), place and press 3 chocolate chips to form a triangle (football tee). 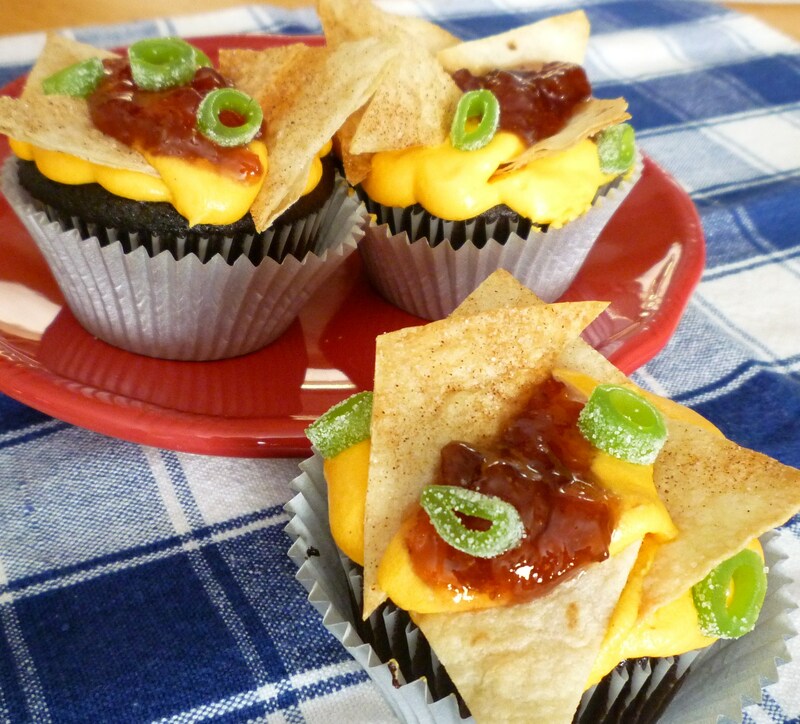 You could use a little melted chocolate to secure the chips if necessary. I had some Sixlets in the correct team colors, but no blue. I went to Party City and made a great discovery … they sell individual colors in big bags, as well as the little sleeves that you can mix and match colors! 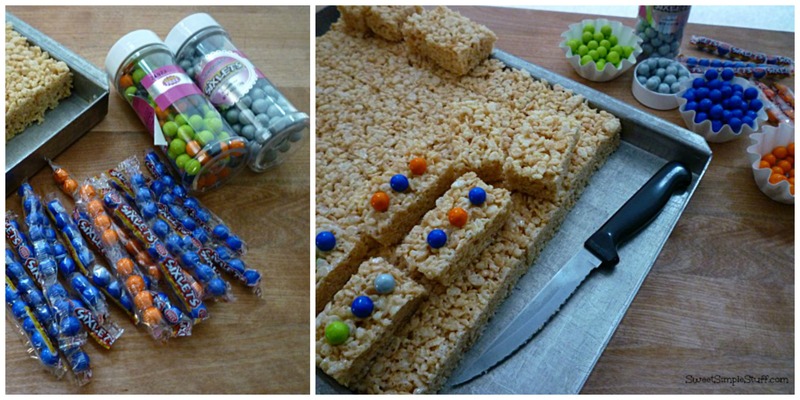 Cut the remaining Rice Krispie treats into bars (about 1″ x 2″), turn upside down and press 3 Sixlets (in team colors) on each bar. I left a few bars without candy for the those neutral fans and non-chocolate lovers. Arrange everything on a large oval platter/tray, about 14″ x 20″ … I used my turkey platter. Are you ready for some football? 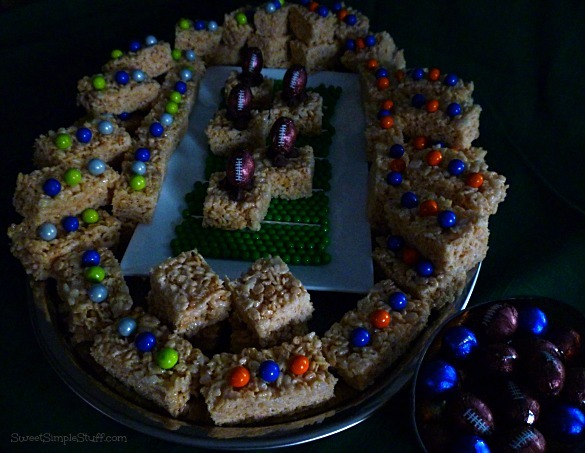 How about Rice Krispie Treats? The little football bowl filled with more chocolate footballs, came from Party City too … only $.99! Thank you to SweetWorks for the Pearls, Sixlets and foil wrapped footballs! That is cute,but there are only three of us & my granddaughter isn’t in to watching Foot Ball or any sport. 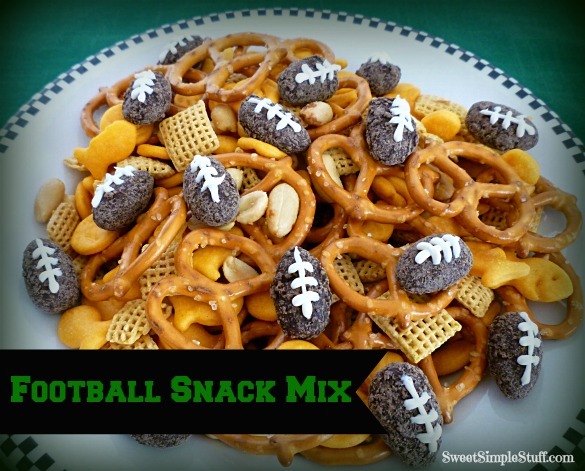 Thank you Anna 🙂 This waaaaay too much for three people … invite the neighborhood over … even if you don’t like football, everyone loves all the snacks! No Party City around here and I haven’t found any place with the Sixlets. I’m intrigued, however, and will keep searching. Cute idea for the boys (big “boys” who watch and yell at the TV). Rice Krispie Treats are a treat at any age. Thank you Kathleen ;). I would try party, cake decorating stores,Joann’s and even Walmart. I have seen bags of the assorted sleeves at Target and dollar stores too! As the 49ers lost on Sunday we are in mourning. But I think your sweet somple stuff will lift the spirits of everyone here! I am so sorry for your loss ;). Rice Krispie Treats will help ! 10 cups of rice Krispies ??? That’s not what the recepie on the box calls for…I would think they would be a little dry. I usually use 1/2 that amount of Rice Krispies. what a lovely set-up for the Big game; cute and very clever. Krispie treats are always a big hit at any time; day, week or occasion. When I make these I normally go ahead and mix up a double; and sometimes a triple batch of these wonderful goodness treat. I have one super large baking sheet that doesn’t fit in my oven so it is used basically for the non-baking items; especially for the krispie treats. Thank you Colleen 🙂 You can never go wrong with Rice Krispie Treats! We’re cheering for the Broncos, too! Thank you Lisa 🙂 I agree … about the snacks, halftime show and commercials … always entertaining! I’m definitely in it for the snacks!! 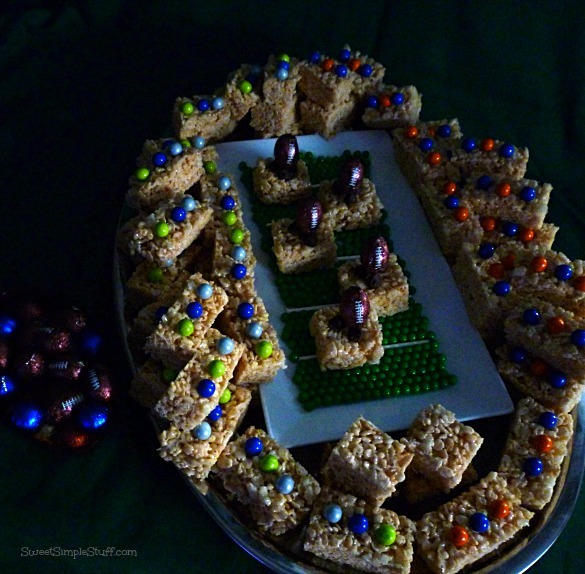 And how cute is this snack stadium? !